A routine dental visit is pretty simple. It may involve a set of X-rays, a teeth cleaning, and an oral exam. Although some people may find aspects of the appointment to be a bit uncomfortable, nothing about it should cause actual pain. Most dentists have a very gentle touch and are eager to help their patients feel at ease in their office. However, if you neglect preventive dental care and end up with a serious problem, such as an infected tooth, you could suffer pain levels that are off the charts before you receive treatment. Even after treatment, your mouth is likely to be sore and/or tender for at least a few days. 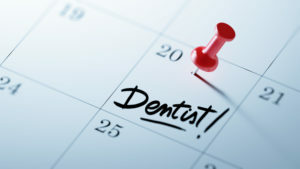 Most people find it easy to keep a routine dental appointment. They can schedule the visit well in advance and rearrange their other activities so they can see their tooth doctor without any added stress. Dental emergencies, on the other hand, are not so predictable. If you and your dentist don’t work together to prevent oral health problems, tooth decay may give you a sudden and severe toothache. You may have to take time off of work or school to see the dentist, and your pain could stop you from enjoying your favorite activities. After treatment at the dentist’s office, you may have to stay down for a few days as you recover from your procedure. Because an ounce of prevention is worth a pound of cure, many dental insurance companies are willing to pay for 100 percent of the cost of preventive care. For just the price of your monthly premium, you could receive biannual cleanings and checkups and an annual set of X-rays. Insurance is not so eager to pay for more extensive dental work, such as root canal therapy, fillings, crowns, and dentures. Your policy may cover just 50 to 70 percent of the cost of such procedures. You could easily end up with a bill that totals hundreds or even thousands of dollars. Skipping routine visits to your dentist might seem to save you time and money and spare you from pain — but the opposite is true! If it has been more than six months since your last checkup, please resolve to schedule a dental appointment in the very near future. Dr. Sarah Esparza is proud to serve as your general dentist in Virginia Beach. She is a member of the American Dental Association and the Women’s Dental Network. As a strong advocate of preventive dental care, she encourages all of her patients to see her twice a year for a routine exam and cleaning. To schedule your next appointment or to ask questions about how best to care for your smile, please contact our office at 757-499-4707.